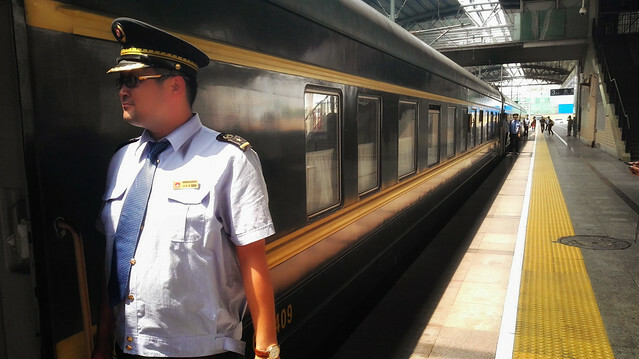 I last took the train from Beijing to Ulan Baatar in 1992 shortly after the Soviet Union dissolved and after Russia had pulled support from Mongolia. Mongolia was closed to foreigners at the time and the only way in was by personal invitation from a local. On my way into China I’d met some dodgy Russians in Hong Kong who were running a black market operation out of a hotel in Beijing where visas could be “arranged”. Entrusting my passport to some seedy mafia outfit, it surprisingly returned a few days later with all the paperwork needed and I was off. At about that time the Russian rouble had previously been tied to the US dollar on a one to one rate, the new government had removed this fix and it had promptly settled at 120 to 1. The Mongolian Tougrik had taken a similar nosedive and official bank rates were having trouble keeping up. Changing money on the street was a prisonable offence but people on the train were keen to change at a rate almost 15 times higher than the bank rate. I changed $20 thinking it’d be enough to start with, received bricks of notes and was giving it away by the time I left a week later. 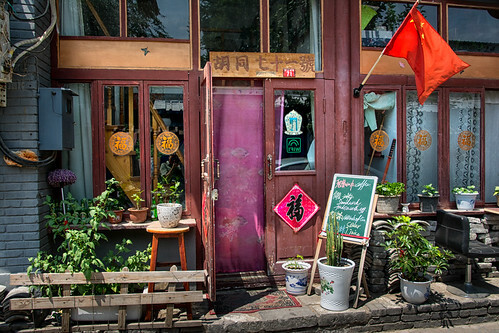 24 years, things are a bit more official … there’s a government kiosk in a Beijing suburb to get the visa, prices are high compared with most Asian destinations and there’s no longer any black market. The Russians will have long moved on to some other dodgy enterprise by now. Getting into Beijing train station is an adventure involving a 25 gate wide rugby scrum, pushing, jostling and shouting its way through multiple security screening layers. 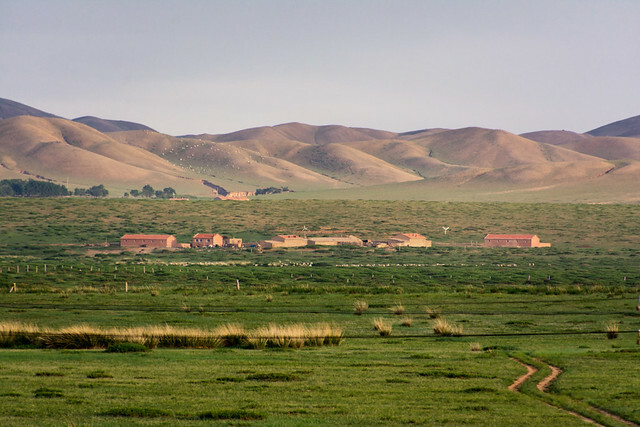 The train to Ulan Baatar is not the most exciting ride, particularly as the most scenic part through the Gobi sand dunes happen at night now. There’s a scenic mountainous area north of Beijing, then you’re into the dusty northern semi desert plains all the way to the border. The current schedule lands you at the border at around midnight where you have to get off for 90 minutes while they change the carriages from Chinese width bogeys to Russian ones. After both sets of border formalities, it’s near 2am by the time I get settled into my shelf sized bed. It’s 31 degrees in the carriage, there’s no cooling other than an open window supplying a steady miasma of diesel fumes from the engine up front. 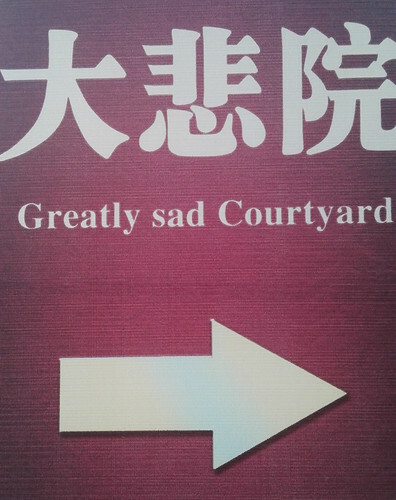 Pleasant. Morning finds the train rattling through stony semi desert with glimpses of goat herders and the remains of the once great ibex herds that once roamed here. By late morning we’re chugging up the first of the grassland hills before arrival in Ulan Baatar some 20 hours after leaving. 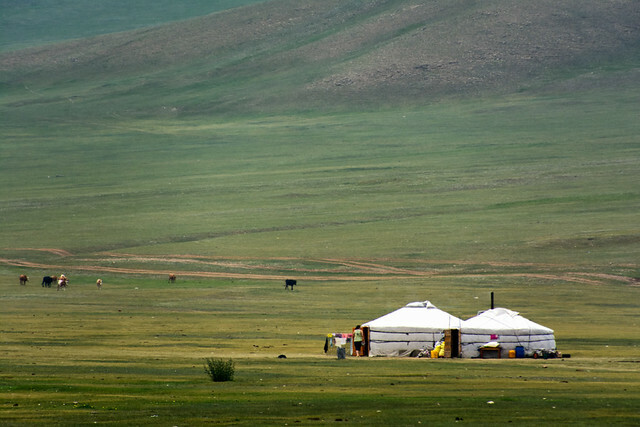 Mongolia is not a country that lends itself to exploring by public transport. Ancient buses bounce you along unforgiving roads to take you from one town to another, bypassing all the wilderness and national parks that make Mongolia so incredible. Even with your own wheels, in a country where the main route is nothing more than several sets of intertwining tyre tracks across the vast landscape with no road signs, unless you’re self-contained with camping gear, a GPS and a set of coordinates then you’ll be spending a long time lost in the wilderness (not necessarily a bad thing). 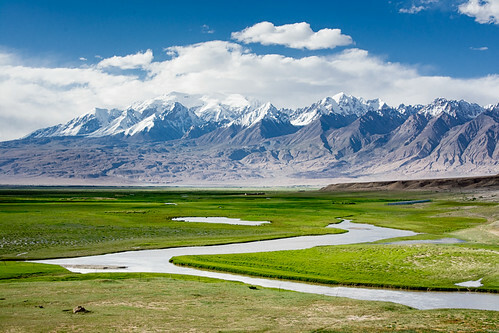 One of the few places where taking a tour is the better option, I sign up to a set of connecting van tours to take me through central, northern and western Mongolia over the next 6 weeks. 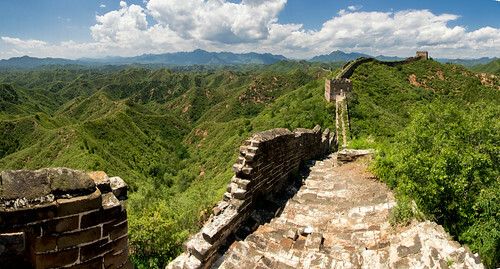 The tours are rough and ready, camping and staying with nomads along the way with a leisurely schedule. It’s a good compromise. 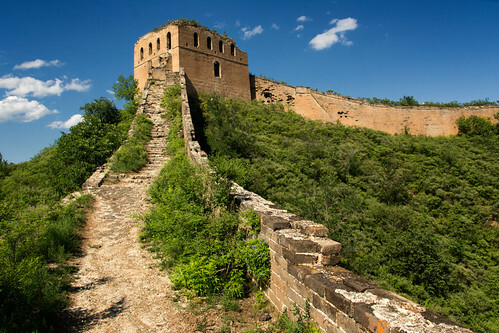 North of the Great Wall sits Chengde, favoured summer retreat for the emperors of the Qing Dynasty escaping from the Beijing heat. The Qings, being Manchus, weren’t too worried about being north of the wall at this stage since that fateful afternoon while sitting about munching dried yak cheese in frigid tents on the plains of the frozen north, they’d noticed a lot of chaos and a particularly large power vacuum and figured they’d head south for a taste of the high life*. 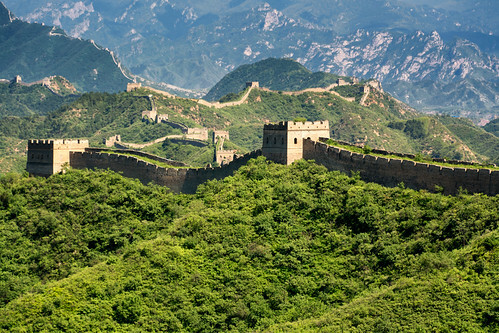 They’d gone on to invade and conquer the whole of China and weren’t too worried about anyone behind them. 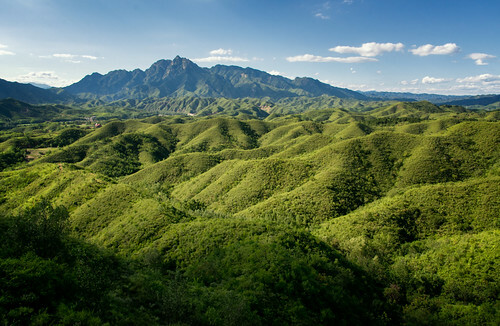 In those days it was a remote forested area teeming with wildlife suitable for hunting (which in China could mean pretty much anything that moves). 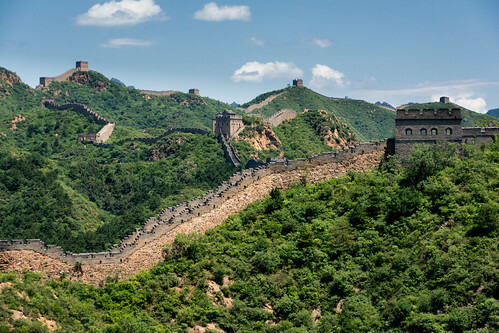 The imperial palace sits inside of a 10 kilometre wall encompassing lakes, parklands and spreading out over wooded hills. Walking in to the park I’m having to plough through milling crowds and scores of loudhailed tour groups which isn’t boding well for the experience ahead, but they seem to only be hitting the buildings near the entrance. The more community minded of these have thoughtfully brought along their portable speakers with the volume turned up to 11, playing some traditional music that, to my unaccustomed ears, sounds a little like the noise a cat makes sliding down the glass roof of a conservatory using its claws for brakes and realising it’s all about to go horribly wrong. As I press on past to places requiring a little effort to get to the crowds thin to bearable levels. 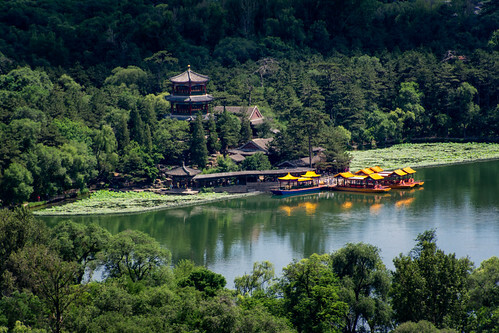 The lakes are dotted with ornate bridges, pagodas, temples and other royal buildings and make for a great couple of hours strolling. 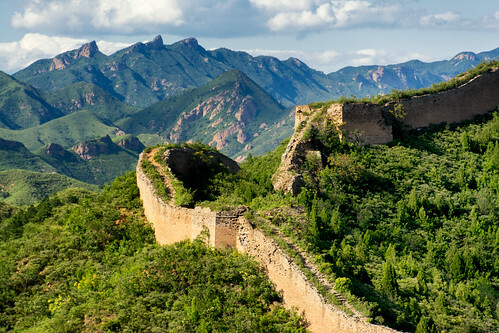 Beyond is sprawling area of scattered temples and forested hills. 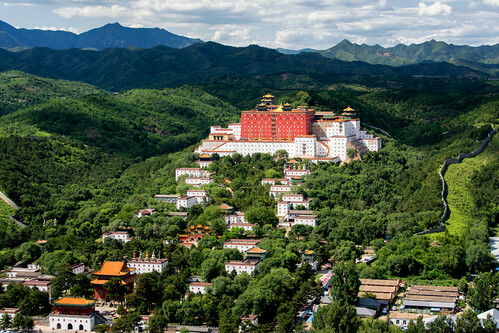 Hiking up to the top of the hills at the back of the park gives outstanding views of the Puning and Putuozongcheng temples, the latter a replica of the Potala Palace in Lhasa. 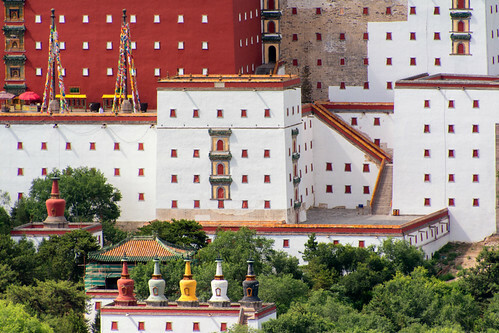 This is one of the residences of the Panchen Lama, highest ranking lama after the Dalai Lama. The 10th Panchen Lama mysteriously died suddenly after criticising the Chinese government’s treatment of Tibetans. His Tibetan nominated successor also mysteriously disappeared shortly after being named and was replaced by a government nominated one instead, which the Tibetans refuse to recognise with arguments from one side saying the Tibetan successor is being held captive, the other saying he’s living a normal life. One of the Panchen Lama’s responsibilities is in naming the successor to the Dali Lama when he dies … expect lots of controversy when that happens. Controversies aside, the temples are outstanding inside and out. 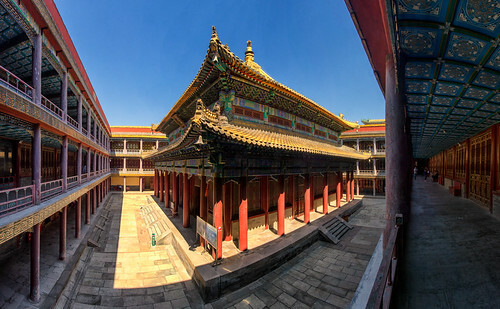 The buildings are, rather than their appearance of huge solid blocks from the outside, actually multilevel courtyards with a huge temple in the middle. Escaping down long corridors leads me down creaky floorboards, past ancient murals depicting scenes from the sutras, ancient carvings and through a general miasma that reeks of history – it could also have passed for musty socks but the monks all seem to be in sandals. 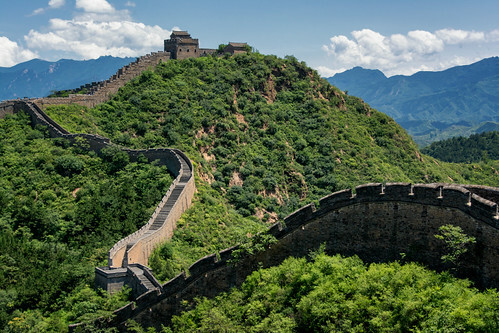 Wandering done, I have the great idea of catching a bus out to the coast to the place where the Great Wall meets the coast. 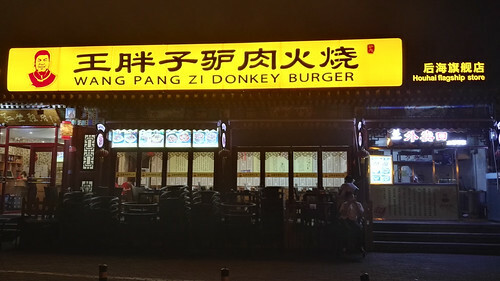 I’ve been to the western extremity where it meets the Takloman deserts in Gansu, hiked a decent section in the hills to the south, this seems like a good way to complete the experience. I’ve had better ideas. 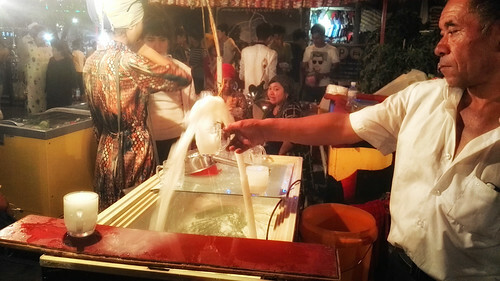 The walled town that formed the first gateway through the wall has been turned into a tourist circus with your senses and eardrums assaulted from all sides, and the circus was in town en masse for the weekend. Trying to find some peace walking down an alley barely wide enough to fit a car down, sure enough, a car hares up behind me and starts blasting his horn at me … as if I’m able to melt into the wall to let him past. I need some distraction from the melee so I stop and cup my hand as if I can’t hear what he’s saying. More horn blasting ensues, along with more hand cupping and gestures to say I don’t know what he’s trying to say to me. He’s going livid by the time I turn around and gently saunter on ahead with the speed of a herd of turtles. The alley widens and he zooms past only to park another 20 metres ahead. Time for more fun, I stop next to his door before he gets out, pull out the phone and pretend to be busy doing whatever it is that people spend so much time doing on their phones. The horn blasting, ear cupping cycle starts all over. I can see he’s gone a shade of purple at this point, time to make an exit through the market before he has an coronary. 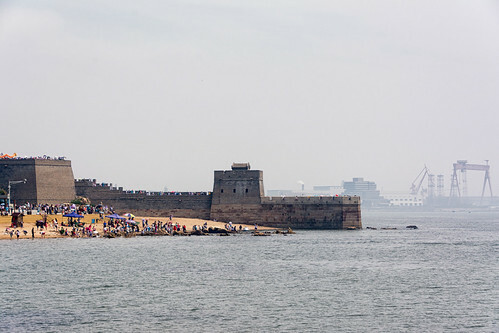 Where the wall meets the sea, a tsunami of tourists has already washed ashore and it’s a struggle to make it out onto the ramparts, which look suspiciously like they were built last week. To be fair (in what has to go down in history as one of the greatest barfights of all time), 110 years earlier, occupying French and Japanese troops starting drinking, things got out of hand, fights broke out and in the morning they all woke to hangovers from hell and noticed that they’d managed to blow apart a significant chunk of the eastern end of the Great Wall*. Sandwiched up against this most historic of sites is an industrial shipyard and docks … I was greeted with a view very reminiscent of what I saw from the western end … so some sort of completion then. I’ve been waiting for 14 minutes to buy a ticket for a bus that was leaving 15 minutes after I got to the bus station. Most of that wait was due to people diving into the front of the queue because a lot of people in this country don’t seem think that any form of orderly behaviour applies to them. As I get to the window someone tries to thrust their money across the front of me, I’ve had enough at this point and physically eject him, perhaps a little over enthusiastically, as he ends up on his arse swearing and waving his hands at me. I don’t care at this point, I’ve got one minute to get my ticket and find my bus in the maze of randomly arranged buses in the parking lot, throw my bag on and go through the standard procedure of ejecting the person from my seat occupied by the person who doesn’t think that seat allocations apply to them. The guy in front has the loudest phone I’ve ever encountered, which he holds on his knee and proceeds to yell at, with equally deafening responses coming back, for the entire journey. The woman behind at least has the courtesy to not put her phone on speaker but is yelling so loud into it that I don’t know why she just doesn’t stick her head out of the window and save the call charge. The guy across the aisle from me proceeds to hack up great pints of phlegm pretty much on the minute every minute to the sound of someone working overtime on a cappuccino machine then gobs it onto the floor between us. Several people are shoving sunflower seeds into their mouths then spitting the husks out wherever they may land. Someone else is vomiting wildly into plastic bags then throwing them out of the window. I don’t want to look down for fear of seeing a flotsam of sunflower seeds riding a tidal wave of phlegm, spit and vomit. Amongst all this, the driver is singing opera at the top of his lungs in between hacking up his own phlegm while chain smoking and driving in the belief that nothing could possibly be coming the other way around those blind mountain hairpin corners so feels the need to take each one on the wrong side at full speed. 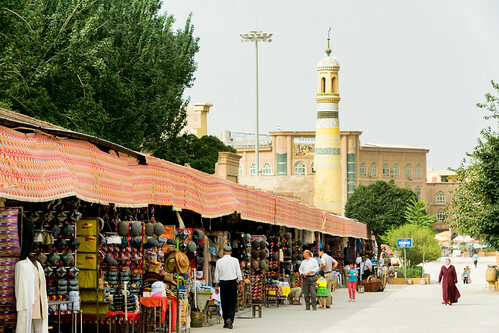 I’ve arrived from Kashgar in Beijing which is a jolt to the system. It’s been 24 years since my last visit. The waves of bicycles have gone, replaced by horn blaring traffic, but it’s not the congested smog-infested megalopolis I’d braced myself for. Don’t believe everything you read in the news. Sure it’s grown vastly over that time, but somehow it has a small city feel to it still. 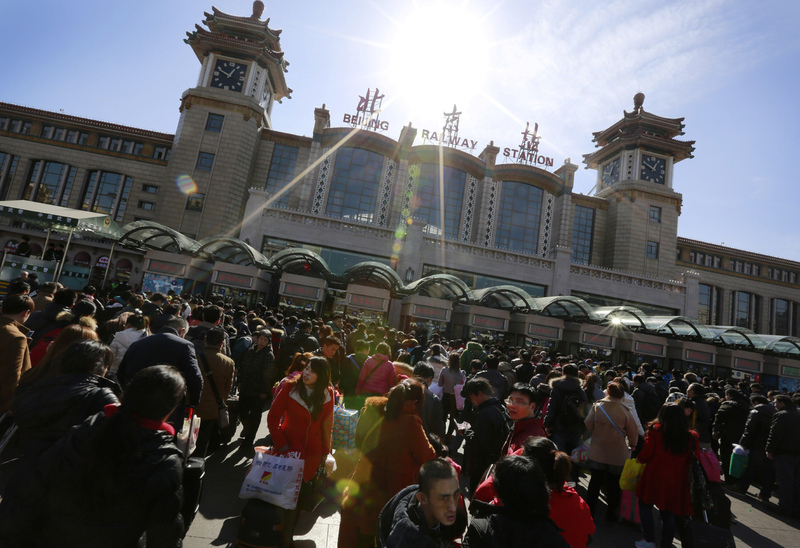 To Beijing’s infinite benefit, the metro system runs everywhere, is dirt cheap and runs like clockwork – if they could just do away with the airport bag scanners at every station it would be near perfect. I’ve got 6 days to kill while I wait for my Mongolian visa to process (one extra thanks to the clueless taxi driver who got lost and delivered me to the embassy 2 minutes after it closed), so I throw myself into some of the many tourist traps on offer. 24 years ago there was next to no domestic tourism, and hardly any foreign tourism. I’d enjoyed many of these sites almost to myself at the time – I’m guessing this time around I won’t be so lucky, but a bit of stealth planning, hitting sites early, going to the less known sites in the weekend, it’s not too bad all things considered. First stop, the 18th Century Lama Temple, a jumble of temples and overlapping ornate rooftops, huge frescoes and smoking incense cauldrons. 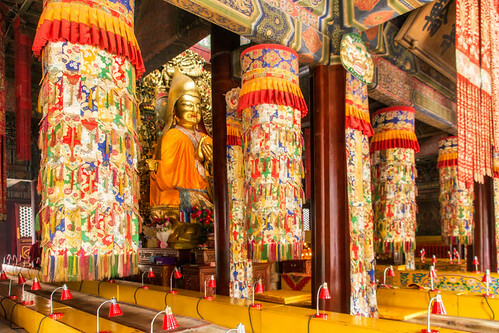 Inside the temples are some imposing statues including an 18 metre high Tibetan Buddha and a wildly colourful lamasery draped in a rich rainbow of prayer flags and banners. The smoky, incense leaden air and dark interior is a blissful retreat from the heat and noise of the chaotic street outside. Taking time out here it’s easy to forget you smack in the middle of one of the world’s largest and most modern cities. 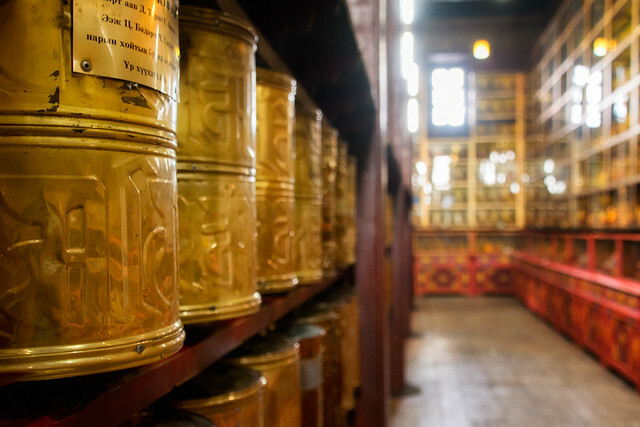 Down a small street from the Lama Temple is another sanctuary from the wild streets, the Confucius Temple where an atmosphere of impassive tranquillity greets you the moment you step through the ornate archways. Some of the buildings here date from the 14th Century, the timelessness seems to permeate everything. 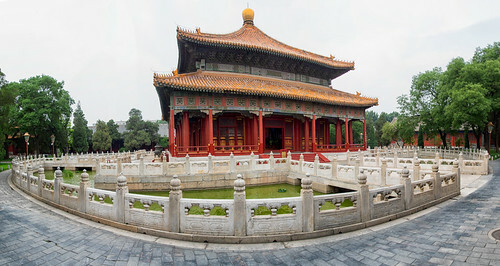 Towards the back is a forest of 190 stelae with each of the 13 Confucian tomes inscribed using over 600,000 characters. 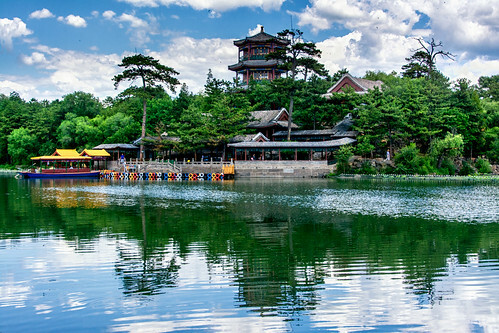 Standing on what was the outskirts of Beijing in ‘92, the Summer Palace is largely unchanged, though the painted walkways along the lakeside are looking a little worse for wear. I have fun memories of trying to find my way out this place back in the day, now it’s a short 20 minute metro ride from the centre of town. 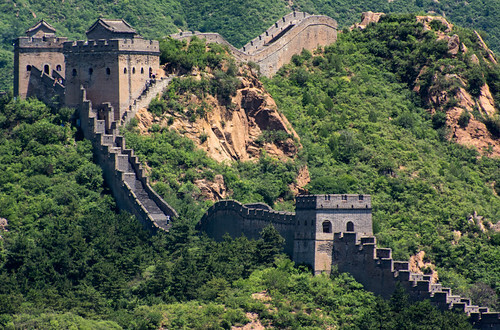 The biggest change (apart from the mass of tour buses parked outside) is the proliferation of ticketed entry gates within ticketed entry gates – user pays rules supreme in modern China. 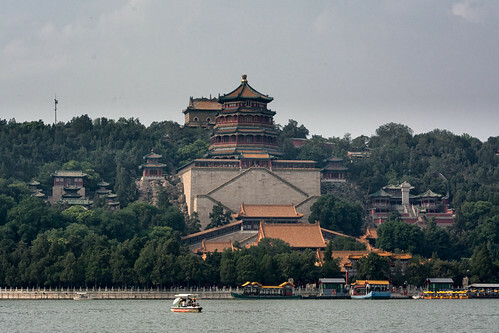 The Summer Palace was built as a retreat for the royal entourage to escape the cloying heat of the city but I’m not noticing the benefit today – it’s a hazy, humid day (or is that smoggy?) but still great to wander around. There are crowds here but it could be worse and with a bit of effort it’s easy enough to find some space with relatively few people, particularly up on the hill where it requires a bit of legwork to get to. 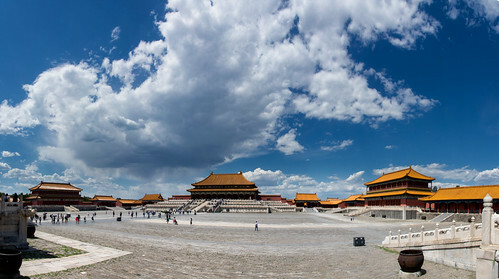 The day I choose to go to the Forbidden City turns out to be scorchio, one of those days that the heat feels blinding. On the plus side, it keeps the crowds away, and as an afternoon heat shower passes through, what people there are run for cover in a panic as if the sprinkling of water will burn like acid … actually, now I think of it, maybe they were wiser to Beijing atmospheric conditions than me and were wondering what the stupid guilo was doing out there in amongst it all … maybe that’s what turned his hair white. Outside the gates I’m approached by two women running one of the oldest hustles in the books: “we’re students wanting to practice our English, can we walk with you?”. “Uh, yeah, sure. Say, is that scam I see written on your forehead?”. Sure enough, 10 minutes later they invite me into a café where I insist on seeing a menu first and see that a pot of tea costs $20. Nice try. I wander off and find an ice cold beer for 50 cents, follow that up soon afterwards with another ice cold beer for 50 cents and come out of the deal $19 better for it. 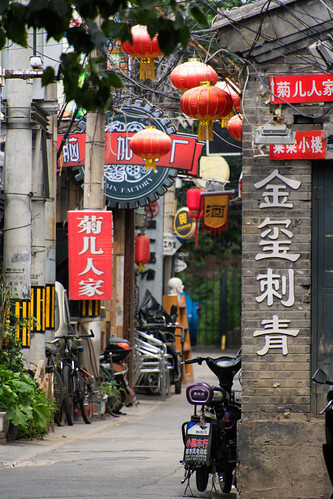 I manage to lose a couple of days wandering the Hutong districts – medieval blocks of maze-like alleyways filled with funky bars, cafés and boutiques, and the usual melange of Beijing streetlife, narrow enough that you wouldn’t expect to see traffic on though of course the local drivers have other ideas … Sights, smells, good food, rooftop patios, easy to become intentionally lost here. 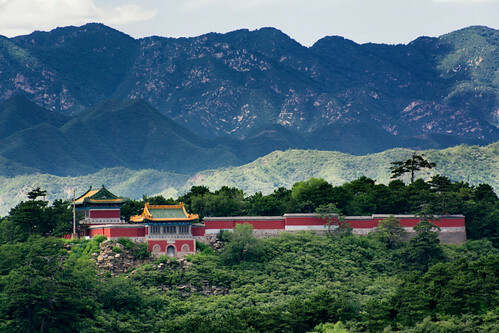 A climb up Jingshang Park hill offers a very hazy view across the Forbidden City and nearby Behai Park just off the is another blissful retreat from the noisy and clammer of the Beijing streets. The Karakoram Highway runs south from Kashgar across the Khunjerab Pass at nearly 5000m all the way down to Islamabad in Pakistan. 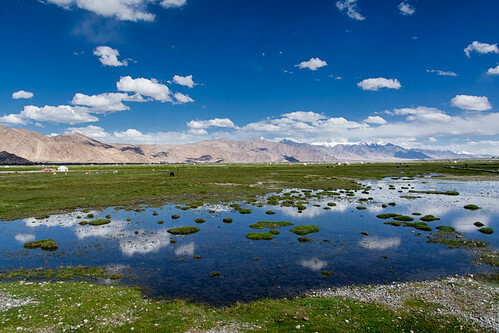 Khunjerab means ‘Valley of Blood’ from the days when bandits guarded the pass and plundered anyone foolish enough to come through this way without the protection of a small army. 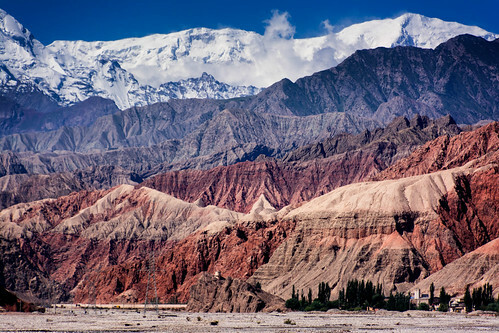 The name Karakoram comes from the days of the Mongol Empire who used this route to reach their south Asian territories, Karakoram was the capital of the empire at the time. I’ve joined a car for a couple of day’s tour exploring up these parts as the prospect of sitting on a bus looking at closed curtains and passing all the best scenery didn’t appeal too much. We head south across the Kashgar oasis and gradually into more dusty plains for a couple of hours before hitting the abrupt line of the northern flank of the Himalayas and into the Ghez Canyon which climbs all the way up to the high plateau through sheer sided walls with glimpses of high icy peaks way above. When upgrading a road in China, the strategy seems to be to rip up the entire length in one hit, then maybe work on a little bit at a time occasionally while the rest of the stretch goes to hell turning a one hour trip into a five hour 4WD adventure. 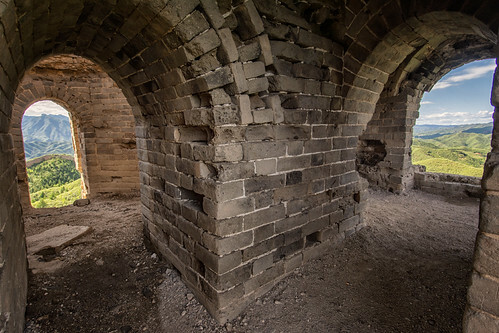 That was the lucky experience along the length of the canyon with most of the road reduced to single lane mud and rock – add to this the habit of drivers in China to drive at each other in an endless game of chicken, it added a bit of spice to journey. On the plus side, you don’t want to be in a hurry driving through this kind of scenery. 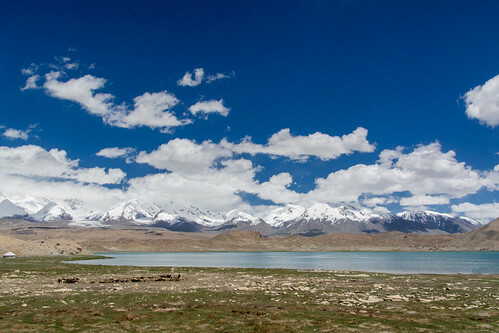 Eventually, back on proper road, we popped out at a dazzling blue lake surrounded by sand dunes of the Sarikol Pamir at around 4000m, and pass through an ever increasing scenery as the two massive peaks of Kongur and Mutzagh Ata mountains loom up at over 7500m each. We stop Karakul Lake for some amazing views across to these mountains, the ice bound tops and massive glaciers tumbling down the valley towards the lake with great reflections. 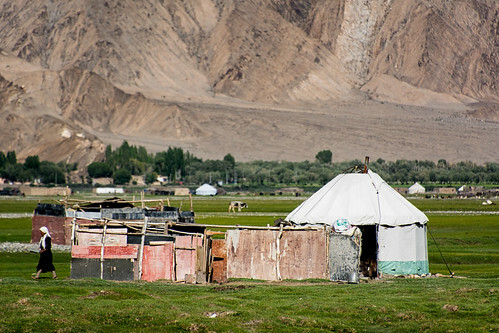 The road beyond takes over more high passes and through deep green lush valley floors dotted with round nomadic tents with grazing yaks and camels, flanked by stark barren mountains. Tajikistan and Afghanistan lie just over the ridge to the right. 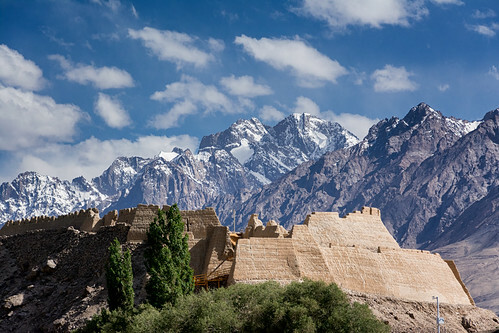 We reach the small city of Tashkurgan set in a broad valley walled in by two long lines of imposing mountains. 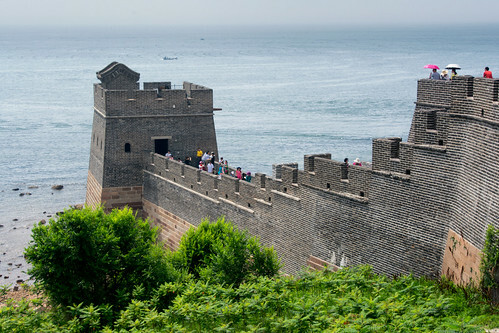 The 1400 year old fort gives incredible views of the vista in all directions (it was used in the filming of The Kite Runner). 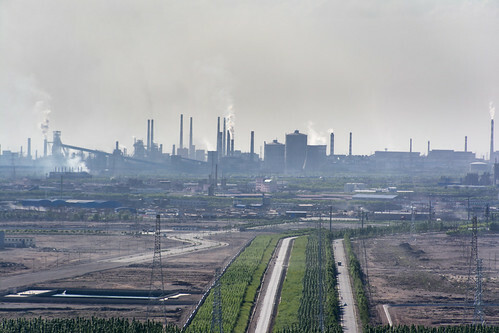 It feels far removed from China up here, more part of a Central Asian republic, with the predominant Tajik people and landscape more reminiscent of Afghanistan or Iran. We have a great couple of hours wandering the fort and the grasslands below before heading back to Karakul Lake for the night. 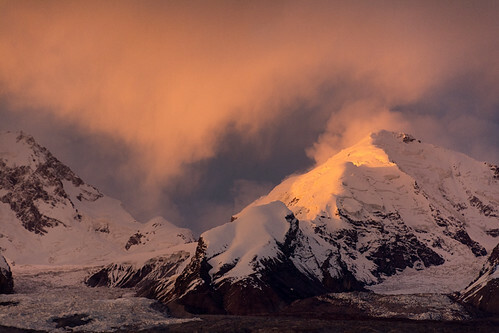 By the time we reach the lake, the sun is angling low through high snow clouds making for some dramatic lighting as the day draws to a close. 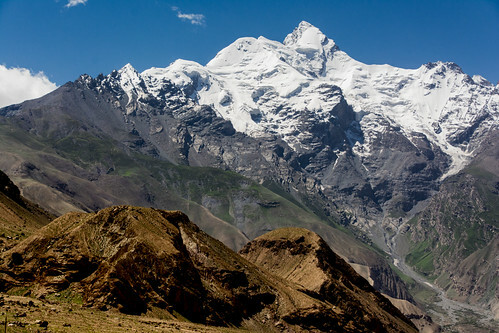 We stay in a nomadic tent and the temperature plummets (the tents inside are incredibly warm, fuelled by a hearty yak dung fire): clear skies, 4500m altitude and the proximity to so much snow and ice don’t make for balmy evenings. 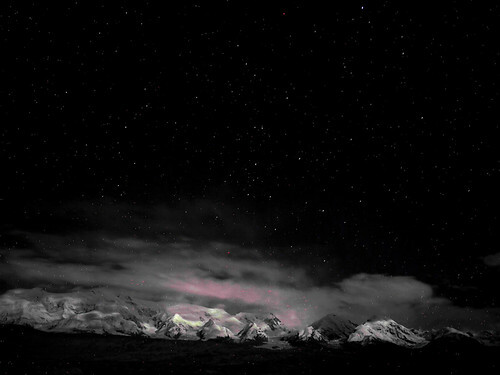 The night sky is incredible with the Milky Way arcing overhead, the high Himalayas lit up by a bright moon. It’s a stunning sight to see which lasts as long as my ability to not shake violently with the cold. Morning breaks with clear skies and more superb scenery. 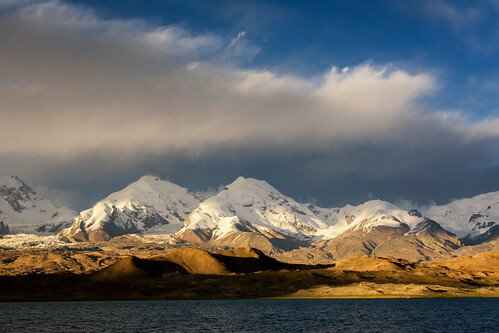 A few hours kicking around the lakeside and it’s time to head back to Kashgar and on to a flight to Beijing to pick up my Mongolian visa to begin the next leg of the adventure. 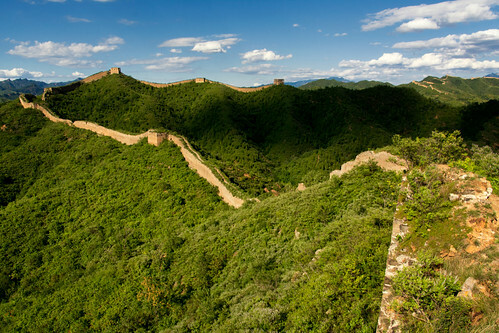 This is the end of the Silk Road for me …. 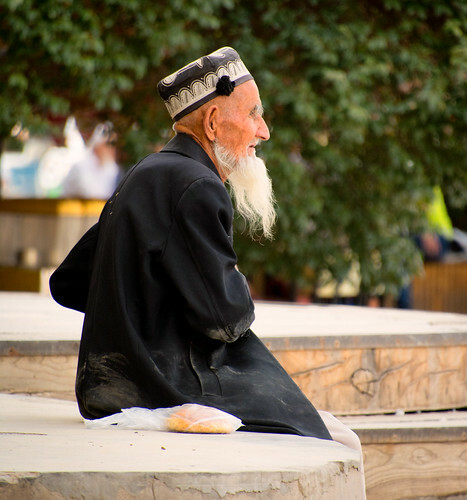 The people here are mostly Uighur with Tajik, Kazakh and ancestors of a host of other peoples who came in its heyday and never left. 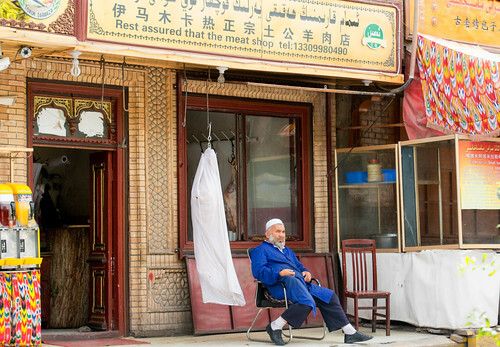 In the last twenty years a significant number of Han Chinese have moved here as part of the government’s resettlement programme, the cynic might say to Sinicise the area, something that doesn’t go down well with the more traditional inhabitants who are strongly Muslim. There’s a strong feeling of control going on here including posters displaying what is considered appropriate Muslim dress and what is forbidden (including hijabs, niqabs, veils of any description and any beards considered excessively Islamic). It’s not a touristy town, in fact many Chinese stay away from the area believing it to be some kind of hotbed for terrorism. It’s safer than a lot of Western cities that I’ve been in. I’ve missed seeing the original old town. The historic buildings were torn down a few years back and replaced with a new old town made from concrete and sprayed with a synthetic mud to give the appearance of the original style. 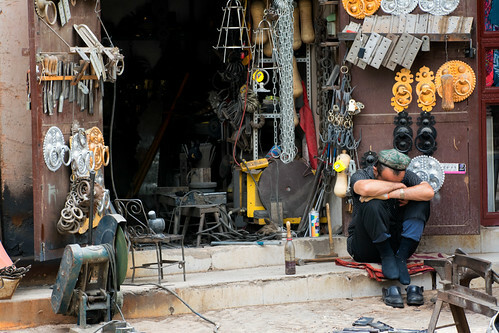 If you don’t know that it’s surprisingly got a very historic feel to it, largely due to the streets being filled with people selling all kinds of wares as it probably once was – various bazaars cater for different specialities including metal work, spices, carpets, musical instruments and hats. 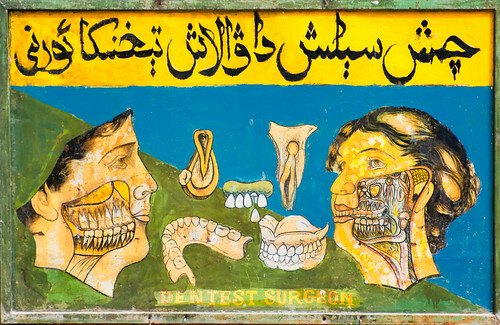 Oddly, it seemed every few shops popped up a back street dentistry … maybe not. While not Turpan heat, it’s still hitting low 40’s and with clear skies the sun is packing some punch. 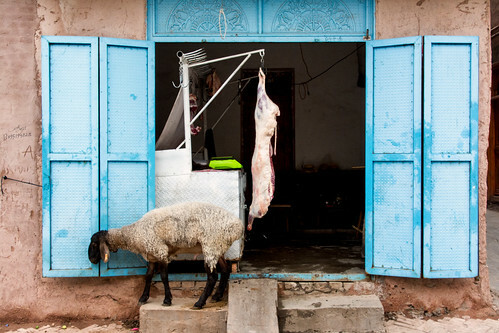 Ramadan is on, meaning the Muslim population are fasting during daylight hours and have taken on a decidedly lethargic attitude to everything. It’s contagious and a few hours of wandering the streets is enough to fog the mind and call for a siesta followed by a cold beer or two. There’s a good crowd in at the hostel, this pattern seems to continue for the next few days. I’m happy to turn down the pace a little after the last 10 days or so of constantly being on the move in the heat. 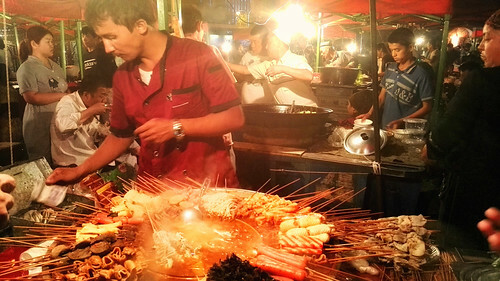 Evening brings more respectable temperatures and the day’s end to the fast kicks off with the opening of the night market street food, which the locals descend on with the vigour of hungry locusts. There’s all sorts of food on offer here, some recognisable, some not. 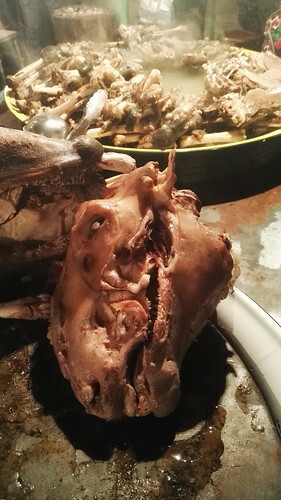 I’m game to try just about anything including the sheep’s head, but I draw the line at stomach (bad experience in Morocco) and the “Fountain of Dysentery” – a dubious hose firing white liquid of some sort into the air and back into an entirely unsanitary looking trough. Good call as it happens, I meet someone later who tried this one and ended up three days in bed. It’s a noisy bustling affair, you squeeze onto tables where you can and get shouted at if you linger too long. Sensory overload.